An odd custom we have, and this definitely summarizes my ambivalence. Luckily, I suppose, my family is all allergic to real trees, so we go the fake route. In any case, very nice…and i love the image as well! lifewords – thank you for referencing the ee cummings poem. It is a wonderful poem with a much more appreciative slant than mine. To all: thank you for reading and complimenting the poem and photo. If you have time, check out the photographer’s link. You will be pleasantly surprised. Interesting take on Christmas trees. Very thought provoking. Qazse: thanks. I must tell you I am the minority in our household and therefore live with a tree six weeks each year. I am cordial but am increasingly distant which makes it even more painful for the tree. ( Odd, I used to worship it). I am lobbying to not have one next year and this poem is part of that effort. 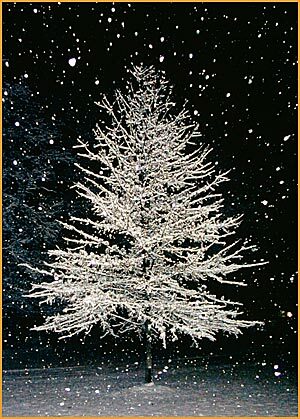 Qazse: Was there a time when you had Christmas trees? Nicely written. Intense. I’m a conservationist for trees so this hit home. Qazse: yes it is a bit intense. thought I’d take a risk…thanks for stopping by and commenting! In what way do you advocate for trees? Oh forgot to mention I’m here via Poetry Thursday. This is excellent, I hate to see Christmas trees littering the streets once they’re taken down. Hey, why don’t you submit this to Festival of the Trees carnival? Sorry can’t think of their address just now, but you could find it via Google or I’ll try remember to come back and let you know the address later! Very intense imagery — I was knocked back by it. The parenthetical lines are very powerful. Qazse: Jessica, I am happy it had that effect…it is what I was shooting for…Thanks for reading and commenting. The shape of the poem is so interesting! It looks like a candle holder. It makes me think of the lights on the tree, but even so much more light than that. Qazse: Dennis, thanks for noticing. I was trying for a tree shape at first but the construct was too inhibiting. In this candle version, the tree at top is the flame. I have a vase shaped poem which, come to think of it, is thematically similar. Regards. Although I don’t like to see the litter they sometimes cause, I know most have fulfilled their destiny and brought happiness to others. My poem today is about women’s fashion change. Qazse: different points of view – Please see little tree – a poem by e.e. cummings. It is a wonderful poem with a much more appreciative slant than mine. Qazse: I am glad you liked the intense. I was tempted to title it just plain “dying for Christ”. What do you think? I’ve always been sad seeing all the trees sitting by the garbage cans after Christmas was over. It always has seemed such a waste of something so beautiful. I love the thoughts in parenthesis. It had just the right tempo for me. Those little lines in the parenthesis are very thoughtful! Intense is right – it makes me question a tradition that I’ve always held as such a norm… great food for thought. I have never liked the idea of cutting down beautiful trees just for our amusement- and you say it so eloquently here… thank you. This is why we bought a “Martha Stewart” artificial tree at K-Mart a few years ago. It doesn’t smell as good, but that’s what air sprays are for, right? I enjoyed reading your poem, sad or not. Woah! This poem is so…I don’t know…it kicks you. It throws risk and rule to the wind (which makes it meta risk and meta rule?) How you describe the tree in the beginning tells me what you then tell me in the end. You needn’t have because I got it; that you did catapults the piece to a different level. Nice poem. Like the use of parenthesis in the piece. I am always sad about cutting the trees down. Beautiful poem. I mentioned The festival of the Trees blog carnival when I last visited, their website is: https://festivalofthetrees.wordpress.com/ and from there you can find out how to submit your poem! Its monthly and features posts from the month previous to that date. Good luck! Qazse: thank you, you are very kind to take the trouble and send me the link. I will do it.